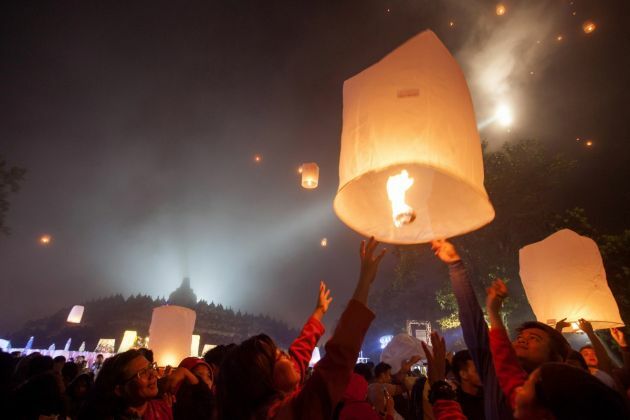 (Photo: REUTERS / Dwi Oblo)Paper lanterns are released at Borobudur temple during celebrations marking Vesak Day in Magelang, Central Java May 15, 2014. Vesak Day commemorates the birth, enlightenment and death of Buddha. The Islamic State jihadist movement is intent on destroying Christianity, Shia Muslims, and now Buddhism. Indonesian authorities have tightened security at the Borobudur Temple, one of the world's greatest Buddhist monuments, following threats made by supporters of the Islamic State to attack the site. Indonesia is the country with the world's biggest Muslim population with some 202 million followers of Islam out of its population of 237 million. Most Indonesians are followers of Sunni Islam. Local police have also started analyzing data gathered from the Internet for possible clues about the planned attack around the Unesco World Heritage site in Central Java, The Straits Times reported on August 26. "The Central Java Police chief has ordered an investigation into the threat and we expect that there will be cooperation with the temple's security personnel and the Indonesia Military to safeguard the temple from any possible damage," the report quoted Indonesia National Police spokesperson Ronny F. Sompie as saying. The threat to attack the centuries-old temple appeared on the social networking site Facebook on August 15 in an account titled "We Are Islamic State." The post read: "God willing, [Borobudur] will be demolished by Islamic caliphate mujahidin!" Built in the 8th and 9th centuries during the reign of the Syailendra Dynasty, the Mahayana Buddhist monument sits on Kedu Valley, nestled in the southern part of Central Java. Touted as the world's largest Buddhist temple, it was restored with the help of Unesco in the 1970s. In response to the threat, the Borobudur Conservation Agency had prepared for a bombing by increasing the number of security personnel around the temple, according to RT.com, the Russian English-language news channel. "We've increased the number of security officers and have coordinated with PT Taman Wisata Candi Borobudur [TWCB, which manages tourism activities at the temple] and the local police," RT.com quoted Marsis Sutopo, the head of the agency, as saying. Borobudur had been the center of a bombing attack in 1985. Extremists detonated bombs that damaged nine of the temple's stupas or monuments. Authorities blamed the attack on Muslim extremists Mohammad Jawad, Abdulkadir Ali Alhabsyi and his brother Husein Ali Alhabsyi. Jawad has never been arrested.